Hmm, just went QRT at 1157z. 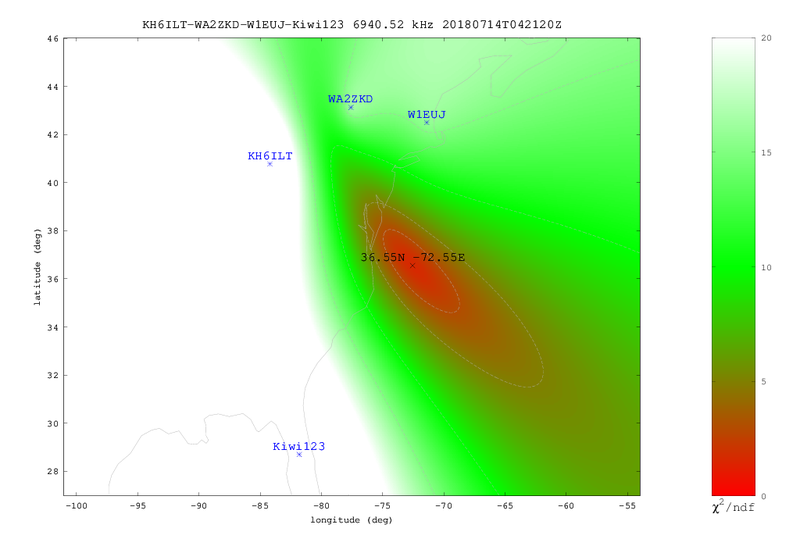 I have been playing around with the KiwiSDR TDoA functionality. It seems to work quite well when use with a bit of care. I just hope that as this functionality gains more of a following that it does not impact the online KiwiSDR network in such a way that it makes these interesting less accessible due to a much higher volume of users. Hopefully as more kiwis get on innernets the load is spread around, or the algo is coded to process at the users local pc. When I look at the log on my Kiwi I can tell when anyone connects for a TDOA session. They still connect, they still take up a slot, however it is only for the duration of the TDOA sample, so say a minute or so. So while it must be pushing up traffic for each Kiwi it only connects for the time required to sample, so it is much less an impact than when you, for example, open 4 Kiwis to use the old, manual, Kiwi TDOA script. Nice to know, Token. Since a TDOA session is so short, it might be nice if the Kiwi software had an option to reserve say one session for TDOA users. Hmmm. Must be a shipborne TX. 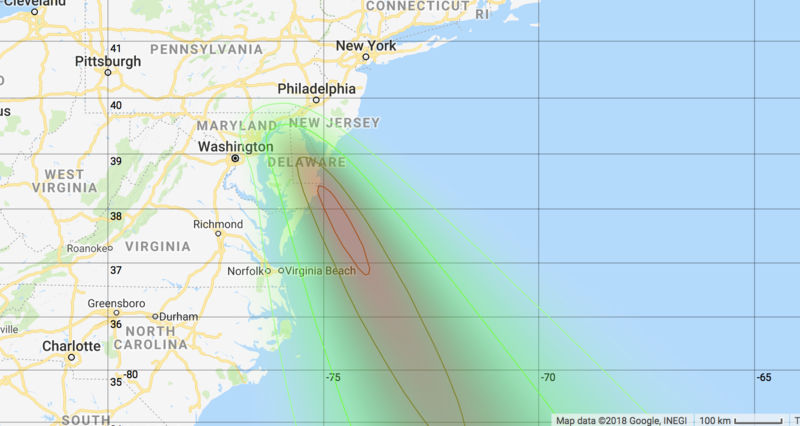 BTW, the slightly different location between the two images taken a few minutes apart with different receivers employed is not at all surprising, even if the TX wasn't on a ship. The point behind posting two photos is that the relative locations indicated on both are far from the image that Chris made yesterday. In the past I have believed a location near Norfolk Va has been used, based on propagation, which fits with your plots. Seems quite probable that multiple sites are being used, also. Although generally in one Link there will only be one or two shore stations, it is pretty much a given that every major shore station can do Link 11, as can every combatant ship, most logistic ships, and some aircraft. Note that I have seen at least 2 different Links in action between 6937 and 6947 or so. 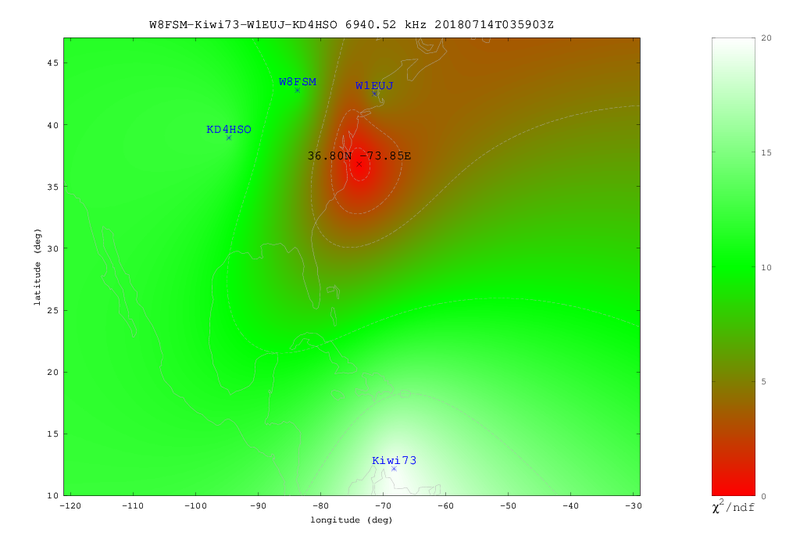 The 6942 kHz Link 11 I have plotted to Florida, around Jacksonville. I would bet there is at least one, and probably several, Link 11's in the Norfolk area, one of them could be operating in the same frequency range. 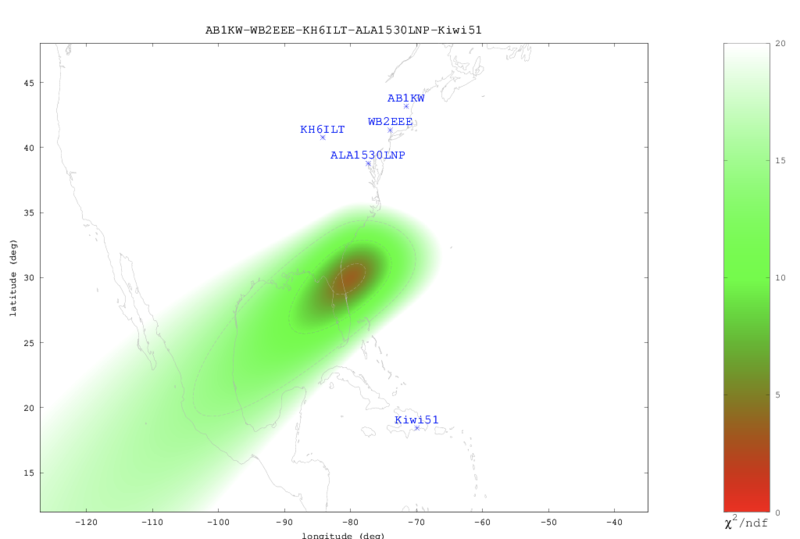 Right now I am plotting the 6940 kHz ISB Link 11 as coming from a platform at sea, several hundred km off the east Florida coast, around 30 N 77 W. Currently I see the 6940 kHz ISB Link 11 network, but I do not see, on any receivers, the 6942 kHz ISB network. And typically there will be more than one participant in an active Link, however I am not sure it is likely that Mayport and Norfolk would be in the same link. By its nature, Link 11 is a network. Sure, you can have one node, polling away, but that is relativley uncommon. And it is meant to work with sea going platforms, and less often aircraft (Link 16 is the more aircraft centered Link, although things like AWACs and ASW aircraft do Link 11 also). Often you can hear how many are in the net, by variations in signal as well as data length. In the old days, when not every ship was Aegis or a carrier of some kind, and in the rare case of an unencrypted Link, you could tell what ship was the Aegis platform. He would be the guy sending all the data, and the other nodes just responding with short transmissions that they were still in the net.